This entry was posted in History, Religion and tagged Christianity, God, Israel, Jesus, Jews, Passover, Paul, Romans, Rome, Saturnalia. This article is so speculatively flawed it’s not even funny. Paul didn’t invent lent or the no meat Friday. Those were incorporated hundreds of years later. Nor did he invent the trinity. The divine Son and Spirit were in the Hebrew Scriptures already. Paul had no plans to make Rome anything, and no Christian recognized Rome as anything other than the Beast of Revelation 13, 17-18 until hundreds of years later. Paul provided the impetus for the syncretist religion that became “Christianity”. He was a Roman citizen, proud of it, and wanted to spread his new religion throughout the Empire. John’s view of Rome was naturally different from Paul’s. If you’re saying the Trinity is a concept expressed in the Hebrew Scriptures, you are out to lunch. Regarding circumcision, of course it wasn’t “completely ended”, millions of Christian boys are still circumcised every year. How do you explain these references in the Hebrew Scriptures? Notice that the plural title for God is used more frequently than the singular (showing plural majesty) – Elohim as opposed to El. Why does Elohim refer to Himself using the plural “us” (Gen. 1:26; 3:22; 11:7; Isa. 6:8)? Who is the Son of the Creator Elohim (Prov. 30:4-5), or the Son of YHWH (Psa. 2:2, 7, 12)? How is it that YHWH is speaking, and then He says that YHWH sends Him (Isa. 48:12-17)? – Jesus and His Disciples were persecuted by the Jews, and rejected by the Jews. Rome had Judea in a province, and the Jews exploited Roman authority to – against Roman law – to crucify Jesus. This is verifiable in both secular and Bible history. 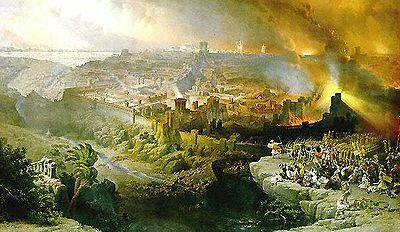 Christian persecution by the Romans did not begin in earnest until the time of Nero, presaging the time of tribulation spoken of by Peter and Paul. – Paul was a Roman citizen before his conversion. Paul, a Jew, was but one of a great number of Israelites having Roman citizenship. It is likely that you consider the term “Jew” to be synonymous with “Israelite”; it is not. The vast majority of Israelites were never called “Jews” or considered themselves “Jewish”. Moreover, Joseph of Arimathea also was a “Jew” and held Roman office. Was he, as well as Paul, also deluded? – The Gospel target was Israelites scattered all over the civilized world, including Rome. – Judaism did not exist in Jesus’ day. The term was coined in the 15th century. The temple practice at that time was Pharisaism, which was the precursor to rabbinism and modern Judaism – not Hebrewism. Its roots were in Babylon, and Jesus railed against them in Matthew 23. I would love to talk to you about this! Brad, that first point of yours is insane garbage. Jesus and his disciples *were* Jews. Jews didn’t crucify Jesus, the Romans did. It wasn’t against Roman law to crucify people who resisted Rome’s authority, it was the standard punishment. You appear to be unschooled in history, or “schooled” by a religious institution, which is the same thing. You need to read some (non-religious) history.